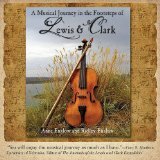 The journals of Meriwether Lewis and William Clark make many references to music and dancing. The leaders of the expedition were not musicians themselves. But two of the men who went with them—Pierre Cruzatte and George Gibson—played the violin, and others sang. Music brought welcome entertainment to the men, far from home. It also served as a diplomatic bridge to the American Indians they met on their way. This CD and the accompanying book trace their journey. . .